We need to begin passing some legislation to eliminate the overworked father from our culture. It would not be such a problem if every family movie did not use it as a starting point, but they do. Fathers of the world, find a new job if it makes you miss your kids soccer game, because the annoying “wife complaining about overworked father” shtick is starting to get old too. Haunted Mansion, of course, uses both of those clichés to get going. Truthfully, you cannot blame the writers. Disney saw dollar signs when their other film based on their rides, Pirates of the Caribbean, took off, and rushed this clunker into production. Who has time to craft interesting characters when you are gunning for profit? Everything about this film is dull, even Rick Baker’s effects, and you won’t hear that often from a fan of practical effects. It takes 40-minutes for anything to actually happen, that of Eddie Murphy spinning around a room while instruments blare in the background. Before that, audiences are given a seemingly endless string of fake scares that are nothing short of repetitive, and even continue late into the film. When you have a movie with ghosts that can teleport all over the place, those “Oh, I didn’t see you there,” scares are awfully tempting. Murphy is simply not funny when constrained in a PG-rated film. Eddie Murphy Raw? That’s funny. Making dopey faces when interacting with kids and special effects? Not so much. If credit is due anywhere, the set designers and craftsman who constructed the mansion did a marvelous job. It looks great, the dim interiors, cobwebs, and long hallways adding a wonderfully creepy vibe to the film. It is a shame then that the story that takes place inside is such an utterly ridiculous cash grab. Haunted Mansion was an early Disney release to Blu-ray, given an MPEG-2 encode that is the likely source of the pervasive softness. The film is loaded with smoothness, taking on an especially digital look when characters stand at a distance. Facial textures are rare, sharing the same soft qualities. The forest outside the mansion is littered with trees, all of them lacking definition. Black levels are deep and rich, but ruin shadow delineation. Crush is constant, blotting out background details of the home and any texture on clothing or hair. Grain is mushy and unnatural, although not much of a bother outside of the Ever’s home. Colors are nicely saturated, providing rich flesh tones that basically wipe a joke about Terence Stamp’s pale skin from the film. There is an odd jitter to the dinner table between 19:33 and 19:34. You can see it briefly move/shake when in motion. It is the only time this seems to be an issue. At 36:16, some diffused lighting causes the frame to appear soft and glowing, no fault of the encode. 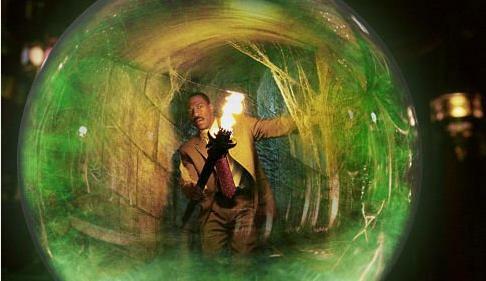 A ghost ball that follows the characters around for much of the film reveals some minor banding. Haunted Mansion comes in compressed 5.1 and PCM varieties. The latter carries a pretty heavy, smooth low-end, especially aggressive during the limited finale. A door to hell opens and kicks off a stream of bass that does not end until the fight is over. When Murphy first knocks on the giant doors, the echo effect also nicely reverberates into the sub. There are a lot of swirling effects in the film to adequately keep the surrounds active. Directionality is impressive, with ghosts and other objects popping up in the rears. The mausoleum has caskets that creak when opened, and zombies groaning. The score seems somewhat subdued, never fully coming alive as it should. It carries a flawless level of clarity, and the organ cues are especially bold, but the sound effects dominate. Dialogue is reproduced fine, with a single moment where the ADR is noticeable (walking into the mausoleum). At one point, Murphy smashes his car through a front window, a scene with fantastic clarity and crispness as the glass hits every part of the soundfield. Two commentaries are included for this dud. Producer Don Hahn joins VFX supervisor Jay Reed and screenwriter David Berenbaum on the first. The second has director Rob Minkoff chatting alongside costume designer Mona May. Grave Spirits is a short film with no explanation as to why it is included. Anatomy of a Scene looks at the graveyard stroll from start to completed effects. History of the Haunted Mansion Attraction is the best piece offered, focusing on Walt Disney’s efforts to get it started.